Welcome to the St. Gregorios Orthodox Church of Austin Website! Our Church belongs to the South West Diocese of America under the Malankara Orthodox Church led by H.H. Baselios Marthoma Paulose II, the Catholicos of the East and the Malankara Metropolitan. Our present diocesian metropolitan is His Grace Alexios Mar Eusebius. Do you have a pair of eyeglasses that you dont need? Consider donating it to make a difference. Bring it this sunday (Jan 28, 2018) and drop off in the drop box in the church. Project in partnership with the Lions Eyeglass Recycling program. Read more on how your recycled glasses reaches the people in need. Would you spare 2 hours of your time to save atleast few of the 3.1 million children that die from Hunger every year. Join us in packing 100,000 meals for starving children across the world in partnership with Feed My Starving Children and Westlake Hills Presbyterian Church. Happy New Year and thanks to all our supporters of the Pidi Ari project for donating more than 18100 lbs of canned food to the local foodbanks and pantries in their fight against hunger and homelessness. Did you know that 3.1 million children die every year from Hunger. We want to save at least a few. Pidi Ari project, a monthly food drive project to support the local foodbanks and pantries in their fight against hunger and homelessness reaches a new milestone - since its launch, the project has collected and donated more than 15,000 lbs of canned food to local food pantries serving the homeless. The Kids for Christ (KFC), a spiritual organization for young children less than 10 years packed care packets for homeless during their summer meet at the St. Gregorios Orthodox Church Austin. The packets were delivered to Caritas of Austin, a non profit that provides services to homeless in the community. 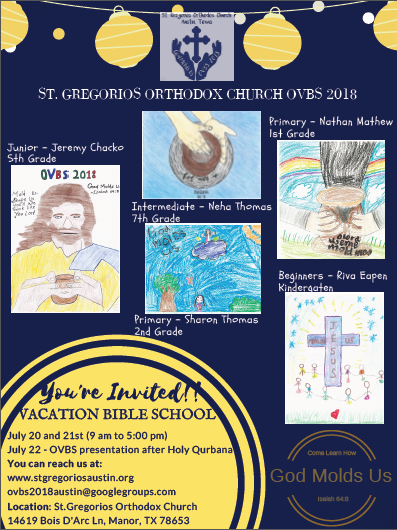 St. Gregorios Orthodox Church, Austin, TX takes home the trophy for first place at the Sunday School Area Level Competitions 2017, 3rd time in a row. Thank you Lord! As we march towards the end of the year, and we look back at the wonders that the Lord has done, we thank all our volunteers for their selfless service to the church and the community. H.G. Alexios Mar Eusebius, Metropolitan, Southwest diocese of America appreciated the awesome work that the youth volunteers undertook and presented them a token of appreciation. With our 'I volunteer at St. Gregorios Austin' campaign of undertaking one volunteer event a month, our youth volunteers have made a big difference this year and has exceeded all set goals of volunteer hours. Thank you! On October 31st 2015 KFC (Kids for Christ) kids were so fortunate to visit Casa Marianella, a transition shelter for immigrant homeless woman and children. Our KFC kids did an amazing job decorating and filling the bags with lot of goodies that are useful for the kids at the shelter. KFC Kids got a firsthand experience about the life of kids at the shelter. of canned food donated since the start of the project. Thank you!